Though marketing may not be your forte, there are things you can do that are very effective in promoting your app and building your customer base. You can try some of the paid options and get varying results, but there are many free things you can do that can have a huge impact. We’ve already blogged about using Twitter to market your app for free. Don’t compare your app or your website to the big fish in the market. You don’t need to have a big, fancy site to get started. Create a simple website (just 1-2 pages to showcase your app) or even use a pre-made template or website builder like Everweb, which is made with Xojo, to pre-announce your app. Launch your website about a month or two before you plan on releasing your app and collect email addresses of people who might be interested in hearing from you when your app launches. Keywords are important for search engines, so make sure that you play up keywords about your app when writing your text. Blogs can be a great way to to attract readers and draw them into your website. Start a blog and update it often with content that relates to your audience. Do make a schedule for the month with the blog posts you think you can put together. Don’t fill your blog with filler content that has nothing to do with why your your readers visit your blog. Think about what they’d want to learn more about, or comment on industry news, talk about your app development progress or anything relevant. Use your social media outlets like Twitter, Facebook, LinkedIn to promote your app, blog posts, product updates, etc. at least several times a week. Become your own video editor! Make a short, creative video to showcase your app and what it can do. Shoot for a funny or thought-provoking theme for your video. Share your video on YouTube and link to it via other social media channels. Find bloggers who write about topics that relate in some way to your app or who are interested in app development, technology, etc. For example, if your app has something to do with music recording, contact bloggers that cater to musicians. An email list of people who have opted in (given their express permission to hear from you) can be a powerful marketing tool. Gather potential customer emails through social media sites and your website. You can use tools like Mail Chimp or Constant Contact to email your audience. This is often a missed opportunity, but your email signature is something that everyone you talk to sees and a great way to make sure you share a message with everyone. Provide a catchy short description of your app with a download link below your signature block to help your contacts know what you’re up to and get them to visit your website. All of your contacts could be potential customers! Encourage people to tweet and share content on their social networks promoting your app. A random person each week can win a coupon to download your app for free, for example. Alternatively, run a contest to win a discount coupon for people who opt into your mailing list and build up your email database. Another idea is to offer a code to people who like your Facebook page or follow your Twitter account to grow your online community. You don’t need a huge budget to get the word out about your app. 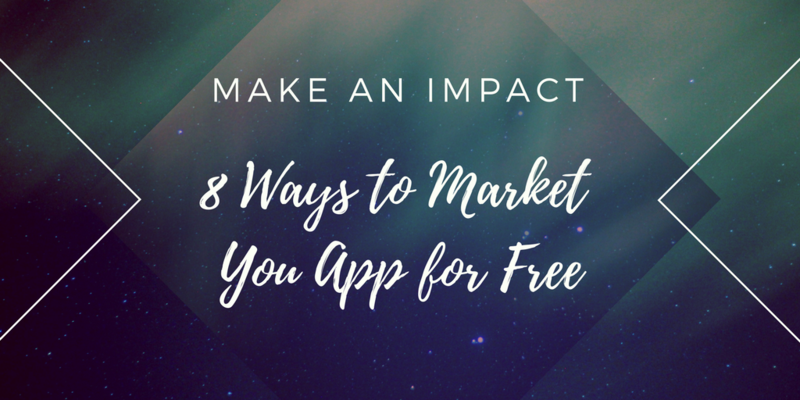 There are so many things you can do to market your app for free, with a little creativity and will to invest some of your time into promoting your app! Join us at the Xojo Developer Conference for more tips and information on how to market your Xojo app.